How Common Are Kids Food Allergies? We are all well versed in knowing that kids food allergies can be serious. Even deadly. What are the most common food allergies in children and does it really seem like EVERY child now has some type of food allergy? It does seem that way, doesn’t it? 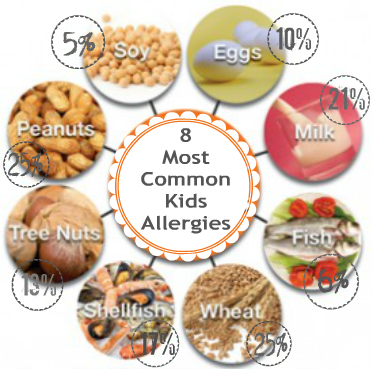 However, according to the FDA (Food and Drug Administration) only 6% of children under three have a food allergy, 4-8% of children and 2% of adults. However, the amount is quickly rising and these numbers may not include those who have an intolerance to a particular food–only those diagnosed with a food allergy through testing or after experiencing a severe allergic reaction. How did you fare? Did you think wheat scored higher than other allergy inducers? What’s your take on the prevalence of food allergies nowadays?